When I heard the Watersons’ LP For pence and spicy ale in about 1977 ‘Chickens in the Garden’ was one of the songs I learned from it. Along with ‘Country Life’, ‘The Good Old Way’, ‘Bellman’, ‘Swarthfell Rocks’ and the two Wassail songs. In other words, about half the songs on the album. At the time, and for many years afterwards, it seemed so very Yorkshire, I almost couldn’t imagine it having been sung in any other part of the country – a local composition, perhaps. 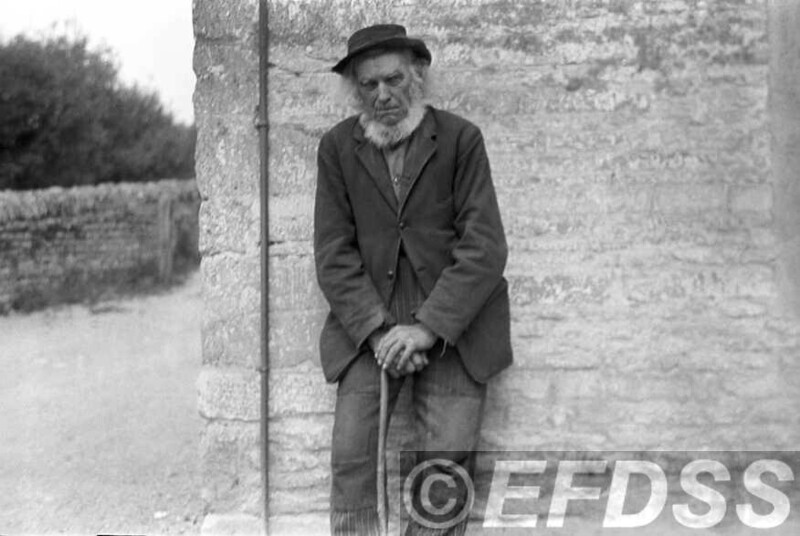 These myths were dispelled when I heard the Veteran cassette Old songs and folk songs from Essex featuring Fred Hamer’s 1967 recordings of a ninety-three year old Harry Green, from Tilty in Essex. Here it was – evidently the same song – but with no mention of Yorkshire whatever. 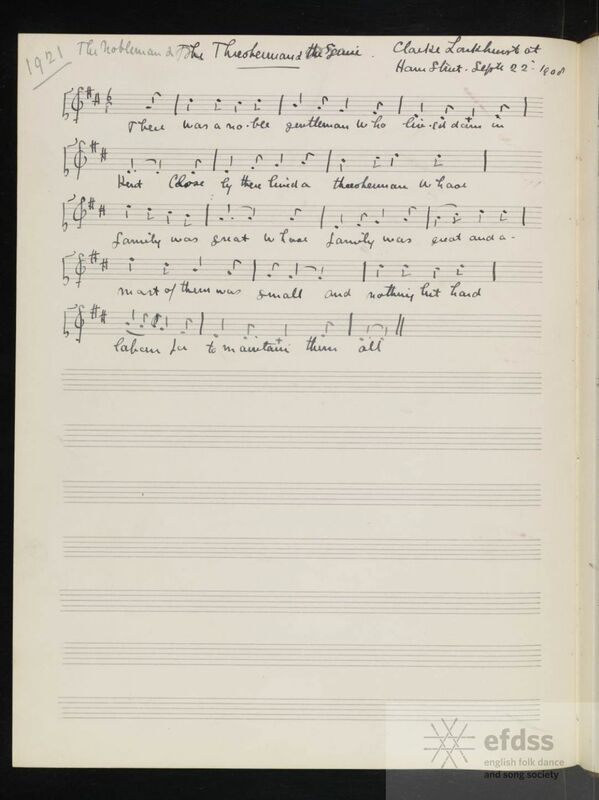 This song, originally entitled The Farmer’s Daughter, or, The Little Chickens in the Garden, was written by American songwriter James Allan Bland (1854-1919) who also wrote Golden Slippers. Sheet music was published by Oliver Ditson & Co in 1883 and the cover states that it was the “Greatest success of the season with 10,000 copies sold in the first week!” Its popularity meant that it easily slipped into the tradition, particularly in America and Canada. It also found its way to these shores and it was published by the Poet’s Box in Dundee and turns up in Jimmy McBride’s collection from Donegal and Neil Lanham’s recordings from Suffolk and Essex. It was also a favourite of Norfolk singer Walter Pardon. The Farmer’s daughter; or, The Little chickens in the garden. From the Library of Congress sheet music collection. Harry Green’s version seems to be much closer to James Bland’s original than the North country ‘Chickens in the Garden’. The words of further versions are provided on this Mudcat thread. These include sets of lyrics similar to Harry’s from North Carolina and Arkansas but, intriguingly, the version recorded from Lena Bourne Fish of New Hampshire starts “While traveling down in Yorkshire”, and also has the phrase “so blooming shy” which was such a memorable feature of Mike Waterson’s rendition. Harvest-homes were ceremonial suppers, given by the farmer to the harvest labourers when the crop was gathered. The custom has been widespread all over Europe, at least since the Middle Ages, maybe longer. It’s an occasion for big eating and drinking and plenty of music; but very ceremonious, and an important feature was the singing of elaborate compliments in the form of toasts. At the harvest-homes in England, right up to the present century, the queenly qualities of the farmer’s wife were commonly extolled (“anything for another mug of ale” was a comment reported by a 19th century observer). This toast, doubtless referring to Elizabeth I, was traditionally applied to the farmer’s wife in many parts of Southern England. The Cuckfield baker Samuel Willett noted it from harvest hands and passed it on to Lucy Broadwood. In spite of the Turk and the Spanish king. We’ll have their drink in a flowing glass. And so shall the rest of the company too. This is included in Volume 2 of David Hillery’s PhD thesis Vernacular song from a North Yorkshire hill farm : culture, contexts and comparisons. I have to confess I’ve only discovered this work whilst Googling this morning, but it looks to be an interesting read. The second song here is one of several healths and toasts included on Vic Gammon’s double-LP set The Tale of Ale. It was collected from Henry Hills of Lodsworth in Sussex and included in the very first volume of the Journal of the Folk-Song Society in 1901, in an article by the collector W P Merrick. 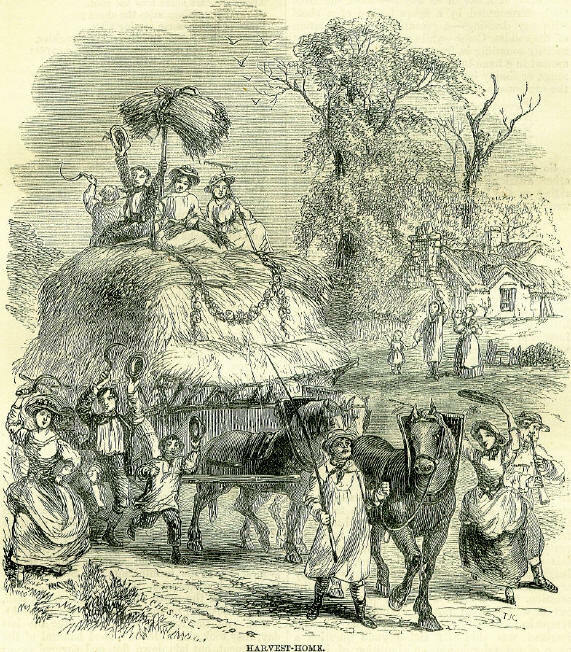 For more on Henry Hills and folk traditions in Lodsworth, see the ‘Lodsworth Folk Songs and Carols’ section in Notes for a History of Lodsworth by Wilfrid Lamb M.A. who was Vicar of Lodsworth 1955-1961. 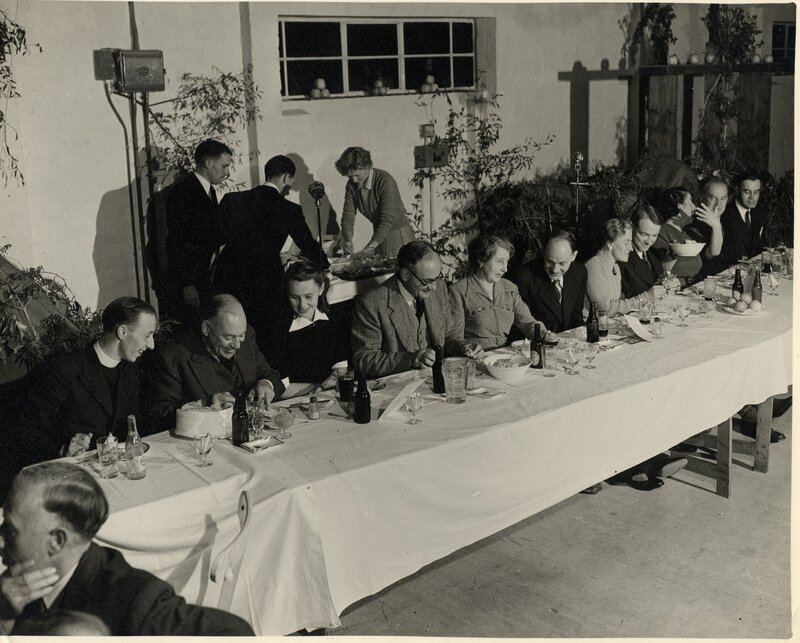 There are some nice photographs of harvest suppers from that era, from Bodiam in East Sussex, at www.bygonebodiam.co.uk. Postwar folk song commentators and activists such as A.L. Lloyd seized on industrial folk song – ‘Blackleg Miner’, ‘Four Loom Weaver’, ‘Coal Owner and the Pitman’s Wife’ and the like – as the product of a proletariat engaged in class struggle. Their Marxist beliefs would, I suppose, have predisposed them against expecting to find similar material coming out of the rural working class, and this was probably just as well – I can think of very few examples of traditional country songs raging against the social order. 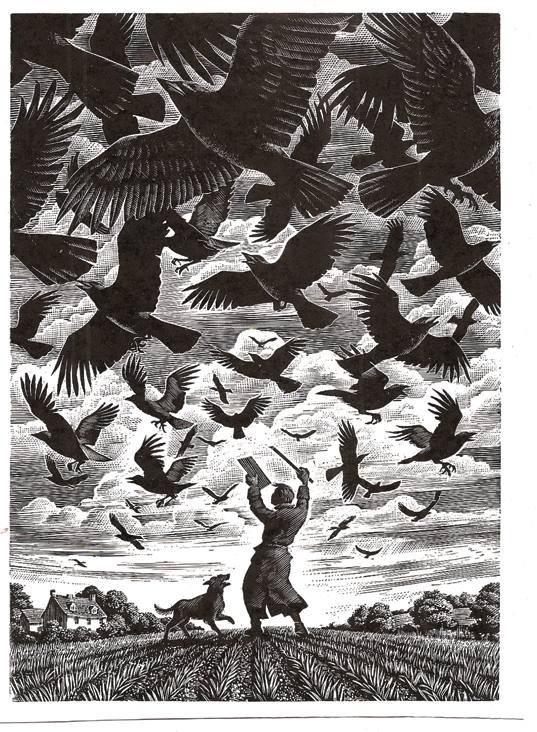 (Even in poaching songs, while there are often complaints about the “hard-hearted judges”, it is the gamekeepers – the agents of the landowning classes, rather than the landowners themselves – who are usually perceived as the enemy). This song, judging by the number of times it has been collected in England and beyond, seems to have been hugely popular. Not only does it not challenge the status quo, but invites us to join in blessing the noble gentleman who – most improbably – bestows “fifty five good acres” on the hardworking labouring man. Although actually traditional singers do seem to have toned down somewhat the obsequious nature of the song as found in printed broadsides, such as Good Lord Fauconbridge’s generous gift, printed by J. Pitts of London, between 1819 and 1844, of which this is the final verse. This particular version was collected by Cecil Sharp at Hamstreet in Kent, in September 1908. 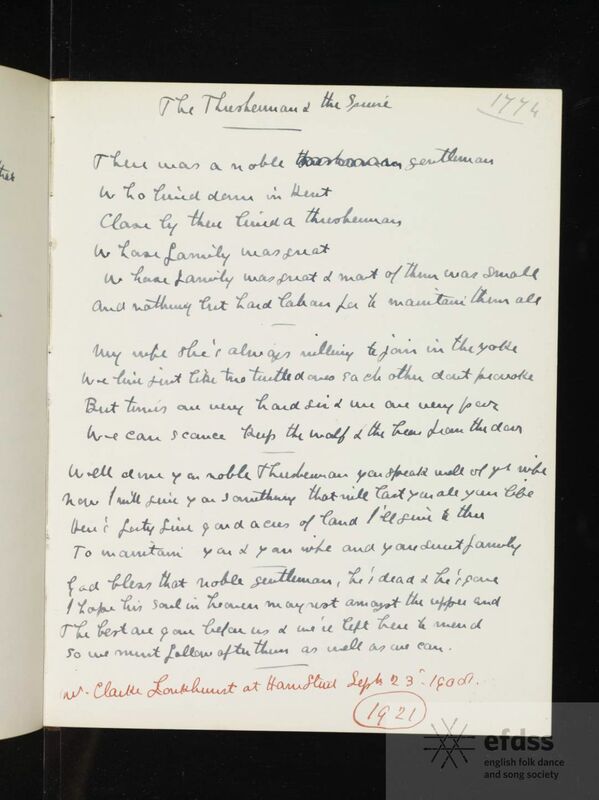 Not being an authority on Sharp’s handwriting, I’d be hard-pressed to say if he meant to record the singer’s name as Clarke Lankhurst or Lonkhurst (or even Larkhurst). In fact it was almost certainly Clarke Lonkhurst, who the local Kelly’s Directory lists as landlord of the Duke’s Head at Hamstreet. George Frampton, who has researched all of the singers Sharp encountered on this collecting trip, has established that Mr Lonkhurst also worked as a carrier, and was a keen sportsman – playing football and cricket, and a member of the Mid-Kent Stag Hunt. He has also found – just to add even more confusion to the matter of his surname – that in the 1901 Census he is listed as Clarke Longhurst, age 37, born at Dunkirk near Faversham. There are Longhursts from Romney Marsh in my family tree, on my mother’s side, so it’s just possible that this singer is a distant relation of mine. Clarke Lonkhurst only sang four verses of this song; I followed my usual practice of completing the words by borrowing verses from the Copper Family version. Had I held on a little, I would have come across a pretty complete set of words collected in 1942 by Francis Collinson from Harry Barling of South Willesborough, Ashford, Kent. This Mr Barling was most likely the same Harry Barling who is listed in the 1901 Census as a Carrier General, living at Aldington, born at Ruckinge; and in the 1881 Census as living at the “Good Intent”, Aldington Frith – i.e. from very much the same part of the world, and a similar age, as Clarke Lonkhurst. The singers’ tunes are almost identical except that Harry Barling’s is in 4/4 and Clarke Lonkhurst’s in 6/8. Including a song collected by Cecil Sharp gives me the opportunity to mention the EFDSS’s Full English archive, launched a couple of weeks ago. 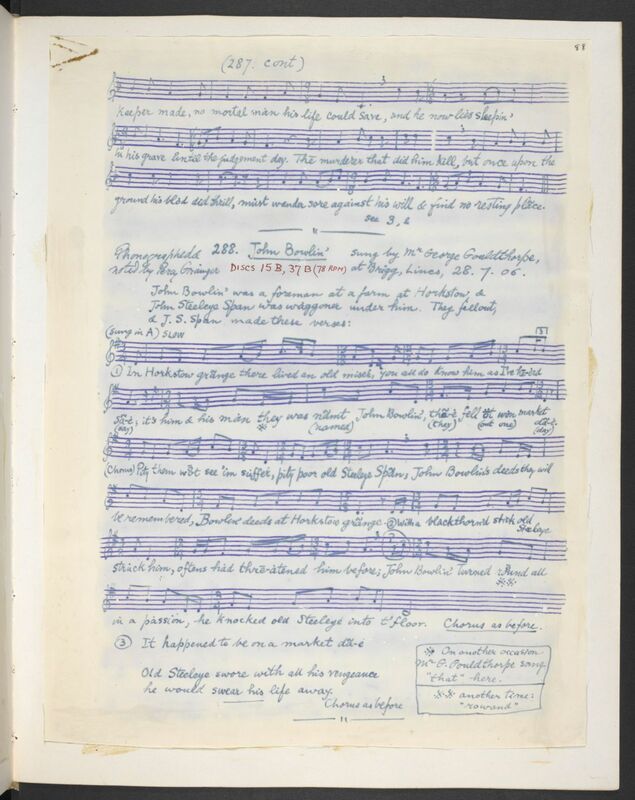 I’ve not, unfortunately, had very much time to explore the site as yet, but it is without doubt an incredible resource – both for researchers, and for those on the look-out for new versions of old songs. It builds on the Take Six archive, which presented digital images of the collections of Collinson, Butterworth, Blunt, Hammond, Gardiner and Gilchrist. 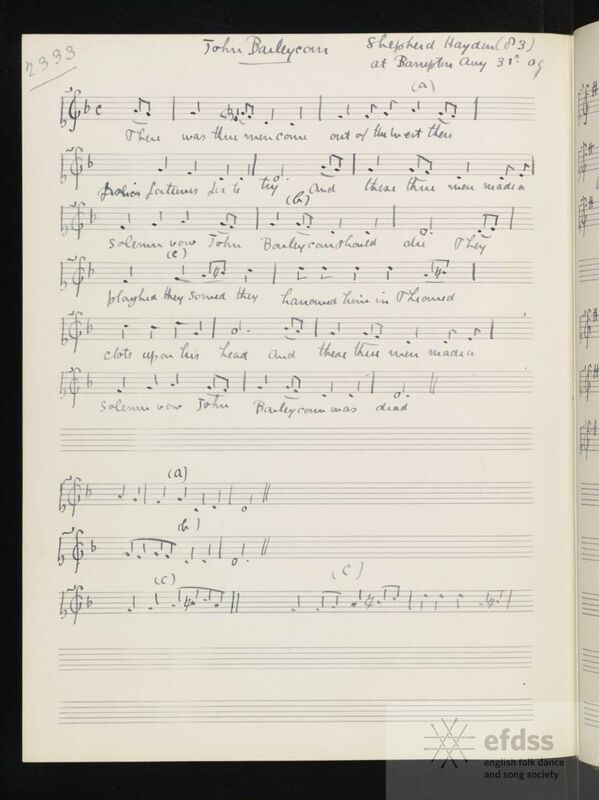 Now we also have access to the work of relatively little-known collectors such as Harry Albino and Frank Sidgwick through to the big names: Lucy Broadwood, Ralph Vaughan Williams and, of course, Cecil James Sharp. The whole thing has been thoroughly and professionally catalogued and indexed, and even looks quite cool – whatever has happened to the DEAFASS we used to love to malign in the past! As you’ll see, each record has a permament URL, to make it easy to refer others to a specific record. And there are some nice little features, like the ability to refer to a simple URL to point to all the versions of a particular Roud number e.g. this song would be www.vwml.org/roudnumber/19 – just substitute the Roud number of your choice. You can’t be a folk singer from Kent and not know at least a few verses of this song. I first encountered it sung by Shirley Collins on the Albion Dance Band LP The Prospect Before Us. When I first heard that I was still a folk music novice, and almost every song I heard was new to me. Given how well-known the song has become, it’s funny to think that, when that album was released back in 1977 Hopping down in Kent was in fact new to most people on the folk scene. 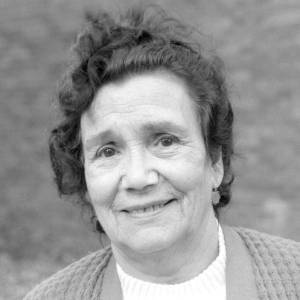 Mike Yates recorded a couple of versions in the early seventies, from Louie (Louise) Fuller of Lingfield, Surrey, and the gipsy singer Mary Ann Haynes, who had settled in Brighton. Both versions were included in the Folk Music Journal, in an issue dedicated to travellers’ songs, in 1975. I’d guess that the Albions’ recording was prompted by this (House in the country, which they recorded later on Rise up like the sun, was in the same issue) – although Shirley may well have known Louie and/or Mary Ann, and heard them singing the song. Louie Fuller’s version appeared on the 1976 Topic album Green Grow the Laurels: Country Singers from the South; Mary Ann Haynes’ version only became generally available on the excellent Travellers compilation (also on Topic) in 1985. Both recordings have since been made available on CD, although the situation is confused by an error with the tracklisting for Topic’s The Voice of the People series. Despite what it says on the CD (and almost anywhere the CD contents are listed on the Internet), it is not Mary Ann Haynes who sings this song on Volume 5 Come All my Lads that Follow the Plough – it’s Louie Fuller. You can hear Mary Ann Haynes’ version on Here’s Luck to a Man: An Anthology of Gypsy Songs & Music from South-East England (Musical Traditions MTCD320). One of the first Gypsy singers that I met was Mary Ann Haynes. I had been told that her son, Ted, was a singer and I drove down to Sussex one Sunday afternoon, looking for his trailer. Eventually, I found Ted and his trailer in a field. He was busy and directed me to his mother, who ‘knew all the old songs’. Mary lived in High Street, Brighton, where, according to Ted, she was known to ‘everybody’. High Street turned out to be a narrow street off the sea-front and was full of large tower blocks. I started knocking on doors, only to be told that nobody knew a Mrs Haynes. I found that when I mentioned that she was a Gypsy doors were closed very quickly in my face. I began to wonder if I would ever find Mary, and was about to give up, when a lady said that there were no Gypsies in the area, only ‘an Italian looking lady’. This was, of course, Mary. When I arrived she was sleeping off a lunchtime session in the pub, but, once roused, she set about making a cup of tea and, having said that I knew her son (sort of), she began to sing as soon as I mentioned songs. Mary had been born in 1905, in a Faversham waggon parked behind The Coach and Horses in Portsmouth, Hampshire. Her father, Richard Milest, was a horse-dealer whose family would accompany him across England during the summer as he made his way from fair to fair. “We used to go to the Vinegar & Pepper Fair at Bristol, then to Chichester, Lewes, Canterbury and Oxford, then up to Appleby and back down to Yalding.” Mary’s husband died suddenly, leaving her with a large family, and, having settled in Brighton, she worked as a flower-seller, earning enough to support her family. Mary died in 1977. Ray Driscoll and Louie Fuller were both brought up in London, and in the days before mechanisation the local workforce would be massively swelled at hop-picking time by families from the East End of London come down for a working holiday – and of course by a great many gipsies and travellers. There are several British Pathé films in the archive about hop-picking. Here’s one from 1946. In the Spring of 1980 my friends Ian and Jane put on an excellent series of folk concerts in Oxford: Nic Jones with support from Crows; June Tabor and Martin Simpson; Martin Carthy and John Kirkpatrick. The latter were in fact joined by trumpeter Howard Evans, and when I saw them the following year at the Lewes Folk Day, they were billed as Carthy, Kirkpatrick & Evans. I can’t remember if they sang this song in Oxford, but they certainly did in Lewes, and I was very taken with it. I learned the song shortly afterwards, when I found the words and music in Roy Palmer’s Everyman’s Book of English Country Songs. And not long after that I first heard the original source, Sam Larner, on the Topic LP A Garland for Sam. A live recording of Martin and John singing the piece – unaccompanied, in unison – was included on the 4-CD box set, The Carthy Chronicles. I had the pleasure of singing this yesterday during an all-too-brief visit to the lunchtime session at The Volunteer in Sidmouth.